When is the current trial supposed to be completed? I remember hearing ‘end of 2009’ but I think this was said by some forum junkie and not the company itself. I think ARI’s chance of success is remote. There are still too many problems with getting HM to work. Plus the company’s credibility has been dimished by Dr. W. What are your opinions? I don’t know which major problems with HM that you refer to. Dermal Papillae cell methods of HM have not shown any problems with hair (the color, characteristics, growth direction, etc) than plagued the cloning-based HM projects. DP methods seem liable to either grow the hairs right or not at all. Aderans has to get the cells multiplied right and get them re-inserted into the damaged follicles correctly. If they can do that, then IMHO the core science of their project should work. if they have had successful studies until today then what they think how much time it would take to bring this cure to market. We know that they removed from their website words “cure would be available by the end of the decade”. Does it mean that their studies isn’t so successful and they have no idea how many years it may actually take. when they gonna finish phase 2 studies? from some articles in internet we can read that studies should be over by the end of 2009. Is it correct and have you finised them by now? when do you publish your phase 2 results as a press release? » much time it would take to bring this cure to market. » so successful and they have no idea how many years it may actually take. » and have you finised them by now? » - when do you publish your phase 2 results as a press release? » » much time it would take to bring this cure to market. » » and have you finised them by now? » » - when do you publish your phase 2 results as a press release? Does anyone know if they are still advertising the trials for recruitment of trialists in those free newspapers? » of trialists in those free newspapers? Then WHY were they advertising in the DC area??? No explanation of that was given. » » of trialists in those free newspapers? mmmh, maybe they meant "we are not recruiting trialists in your area anymore?" If the adv was published 2-2.5 months ago, and you emailed them 3 weeks ago, it is possible that they already finished recruitment by the time you emailed them. It is clear that they are indeed running trials in DC. I live in the immediate DC area – about 7 miles from Washington. I gave them my address. Their email didn’t even say “not conducting trials in your area anymore.” It simply said they are not conducting trials in my area. It was a “form” email – not personalized. Spanish Dude – maybe they were only recruiting in all these cities (like DC), but doing the trials only in a couple of cities like Philadelphia and Atlanta, where ARI has labs…? After all it’s only about 2.5 hours from here to Philadelphia. And maybe now they have enough trialists? We are not doing any clinical trials in your area at this time. 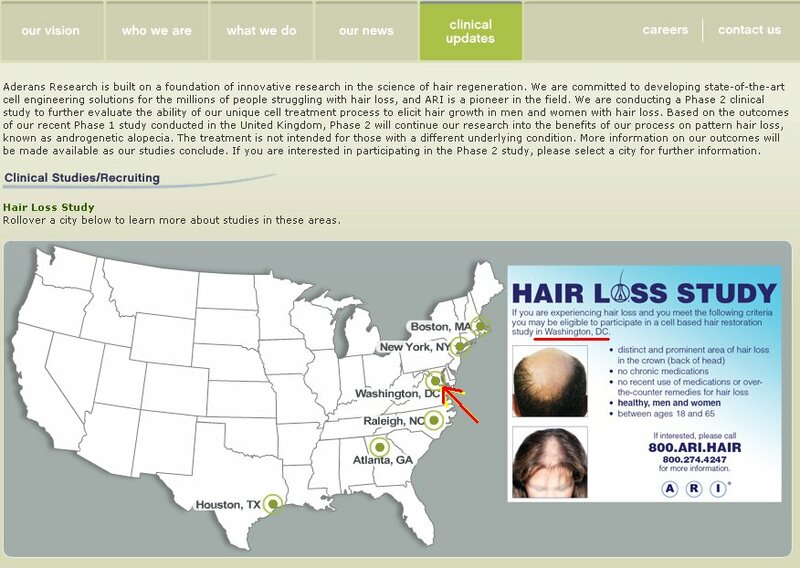 We are recruiting for our Phase 2 clinical research study in the US. We must at least await the results of the study before we can provide an estimate of general availability with any assurance. We understand the interest and desire to have a cell-product such as ours available for treatment of hair loss, and are working diligently to meet the hopes of people such as you. My idea is that Bosley has clinics in all these cities. The trialist go to the Bosley clinic in his/her city, they take a biopsy (donor cells), and they send the biopsy to the ARI labs (Philadelphia or Atlanta or wherever). The cultured cells are sent back to the Bosley clinic for injection. And the followups also in the Bosley clinic. This was my idea, but of course it could be that, as you suggest, the trialists had to travel to the labs for biopsy and for injection, and followups were done in the Bosley clinic. But in any case, if they are recruiting in DC, this means that there is a trial going on in DC, regardless of where do they take biopsies and make injectios. And the email should have specified. The email doesn’t make sense. They answered that “we are not conducting trials in your area”, but even if the trialists had to travel to other city, this doesn’t warrant that answer. It is irrelevant if they are conducting trials or not in your city, the proper subject is if they are recruiting or not, and the advertisement said that they were recruiting in DC. Well, in fact the advertisement said that they were “conducting a study in DC”. so yes, you are right, the email doesn’t make sense. at all. Maybe the trial was cancelled in DC??? » area. It was a “form” email – not personalized. » here to Philadelphia. And maybe now they have enough trialists?